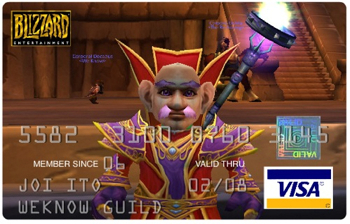 One year ago, I blogged about Phillip Torrone musing about the idea of WoW credit cards. Now it's true. Why would you put your Credit Card number on the web? Nice to see you on Twitter. You should tweet more, since you have so many good links and insights to share. Replace with: "What are you thinking/linking now?" Now the logical step would be to not just have WoW / Second Life credit cards, but to have them customized: I'd guess you'd like to have one of your own avatars printed on your credit card instead of some random generic? Interestingly nothing on the public site maps what the points redeem at (i.e. how many points = what inside of WOW). "Accrue World of Warcraft gametime at the rate of 1% of every dollar in qualifying purchases. The World of Warcraft Rewards Visa is the only card that pays you to play." Just game time, not game gold. Not exactly the future of credit: it's still flight miles, just a little more fuel efficient. I asked my guild who was going to sign up for the card, and the best answer I got back was "When they stop nerfing my class, I'll sign up for their card." My nephew who is all into World of Warcraft, says it is becoming more a business, a product, and less a game. A divide is occuring, according to him: players who spend 5 hours a day on WoW vs. players who spend 20 hours a day. He says users are ignored, and the company is adding features and etc. that the passionate users don't want, making it harder to win, and so on. Not a gamer, so I have no idea what he's talking about, but anyone else feel the same? P.S. Joi, I'm sleeping more peacefully now that I know that is a fake credit card number. I've stopped using all forms of credit cards because they're designed to get people in debt and keep them there. I'm more of a supporter of ditching credit cards. Just have a look at http://debt.worldwidewarning.net in case you're not sure just how they're aimed at wreckage maximus. Joi Ito - "The NOW of Credit Cards" by Joi Ito is licensed under a Creative Commons Attribution 4.0 International License.